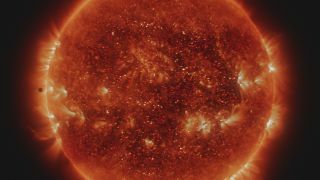 Nat Geo's "One Strange Rock" explores Earth's complicated relationship with the sun. Planet Earth and the life it contains wouldn't exist if it weren't for the sun. But the sun also poses a serious threat to life, by constantly spewing harmful radiation into the solar system. Exactly how life on Earth managed to survive and thrive in the face of this danger is the subject of a new episode of "One Strange Rock," which airs tonight (April 9) on the National Geographic Channel. The new series explores all the strange coincidences that allowed life to arise and flourish on Earth. Each episode is narrated by astronauts, invoking the unique perspectives of those who have seen our planet from outer space. The first two episodes focused on how Earth "breathes" and how a violent history of cosmic collisions made our lucky planet the habitable world it is today. While Earthlings couldn't do without the sun, the vast amount of energy the star expels could also completely obliterate life in the solar system. Thanks to a combination of Earth's atmosphere and a magnetic shell known as the magnetosphere, we don't have to worry much about subatomic particles or UV radiation bombarding us. With a little sunscreen, we have all the protection we need down on Earth. In space, without our home planet's natural defenses, the sun is far more hazardous. Take Mars, for example. Because that planet has a thin atmosphere and no magnetic fields, what looks like it could have been a cradle for lifeis, in fact, a barren, uninhabitable landscape. Likewise, scientists believe that Venus could have supported life billions of years ago. However, Venus also lacks a magnetosphere, and its atmosphere is so thick with carbon dioxide that a so-called "runaway" greenhouse effect caused a massive temperature increase. This made Venus the hottest planet in the solar system, even though it's not the closest planet to the sun. Earth, Mars and Venus are all in the "Goldilocks zone" of our solar system, which means they are just the right distance away from the sun to be habitable planets. So, what makes Earth so special compared to its neighboring planets, and how did we end up with these natural defenses? Hoffman and his fellow astronauts explain it all in tonight's episode of "One Strange Rock." Catch it on the National Geographic Channel at 10 p.m. EDT/PDT (9 p.m. CDT). Check local listings.